​The Sheffield Branch of the Classical Association was founded in 1920 by a group of local academics from the University of Sheffield, local school headmasters and local dignitaries with the aim of promoting the study of Classics in the local area. Opposite is a portrait of Sir William Henry Hadow, Vice Chancellor of Sheffield University and Vice President of the Sheffield CA. Upon its founding, the President was Walter Coventry Summers, Firth Professor of Latin, alongside Leonard Burrows, the Lord Bishop of Sheffield, Dr Lloyd Storr-Best, headmaster of Firth Park Grammar School, and Sir William Henry Hadow, Vice Chancellor of the University of Sheffield, who were all given the office of Vice President. In the early years, a President was expected to stay for three or four years before resigning and generally being given a Vice Presidency for life, unless they moved away. The Presidency was rotational, swapping between university staff and school teachers, as this ensured that there was a fair representation and focus. By 1928, membership was healthy at 52, and the difficulty with involving local schools in their lectures and programme had mostly subsided. 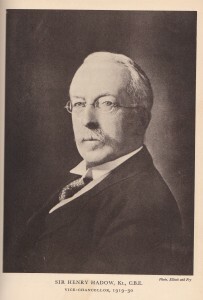 The diversity of members of the committee also remained, as they had one of the most influential paediatricians of 20th century Sheffield as their president, Dr A. E. Naish. The rotational presidency paused from 1925-1940, with all the Presidents in that period being members of the university. This proved useful, however, when it came to booking rooms for lectures, as having an important member of university staff as President meant that the normally high cost of rooms was waived. In 1940, the first female Vice President of the Branch was elected. Mrs J. H. Doncaster had been a founding member of the branch, and had held a key role in the committee. She had ties to the university and the local community, as her husband had been treasurer for the university between 1932-34, as well as having been President of the Sheffield Chamber of Commerce from 1923-4. During the Second World War, the Branch remained very active; the only effect of the war was that a couple key members were absent, having been called into service, and that meetings had to be held earlier due to the black outs. School lectures were moved from week day evenings to Saturday mornings, and schools were sent details of air raid shelters. However, after the War things became harder for Classics in general. Latin and Greek were taught less in school, and after 1960 Latin was no longer compulsory for reading Classics at Oxford. Greek had not been compulsory since 1919, and with the rise of English to a position equal to that of Science and Maths, Classics took a back seat. State schools were no longer as interested in teaching Classics, Latin or Greek and so their interest both in Classics as a subject and the Classical Association diminished slightly. The founding of JACT (Joint Association of Classical Teachers) in 1962 helped the CA, as it formed an umbrella organisation under which the CA, the Association for the Reform of Latin Teaching and the Orbilian Society combined. This allowed the school teachers to have more say in proceedings, as previously the Sheffield Branch had been dominated by University staff. During the 80s, the Sheffield Branch began to struggle, as in 1989 the Classics department was moved to Nottingham, taking a great many of the active members of the Sheffield CA with them. Thus it fell to the Classics teachers to carry on, although the change in the National Curriculum at the same time, led to Classics, Latin and Greek no longer being taught in as many schools as previously. In interviews with members of the Sheffield Branch of the CA who taught in schools at this time (and indeed still do), they said that despite the hard work they had to put into the CA, it helped them maintain links with one another, particularly between state and private schools. Gina Johnson, Classics teacher at High Storrs, said that it was particularly hard for a state-school Classics teacher at that time, as Classics was (and still is) far less popular in state schools, and so the links she made with the CA members were welcome. 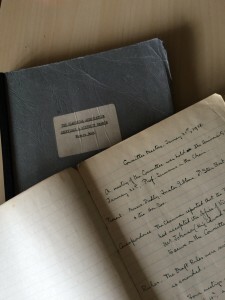 Although there was a lack of active members in the Sheffield Branch according to the minute books, those who were left were able to carry on the Classical Association through the schools. Gina Johnson, Vin Knowles, John Wade and Sarah Armstrong were members of the Sheffield Branch’s committee who kept it going after 1989. 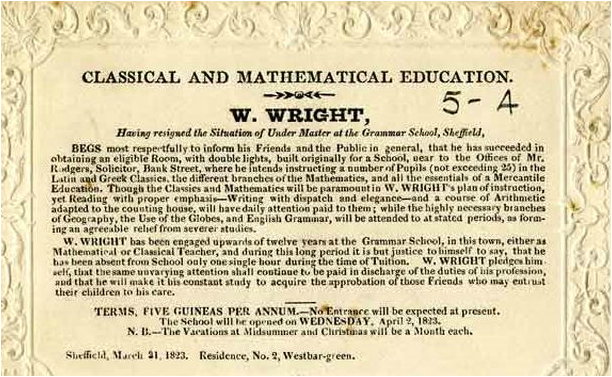 They carried on the Day School that had been established in conjunction with Leeds, with Latin reading competitions and lectures from all sorts of people. However, by the early 2000s, interest from the public seems to have diminished to such a level that the Sheffield Branch went into a brief hiatus, with the last entry in the minute book (see illustration above) being the Annual Business Meeting of 2003-4 until it was restarted by Dr Julia Hillner and Dr Jane Rempel in 2010. Written by Isobel Bowden. Research into the History of the Sheffield Classical Association was conducted with support of a SURE project grant from the University of Sheffield and under supervision of Dr Julia Hillner.